It’s been reported that HTC, the biggest manufacturer of Win Mobile devices, will by end of 2009 have moved 30% of its device lineup to Android, and by 2010 around half of new handsets released by the company will be powered by the Google-led OS. Part of the reason is that Android is free to license unlike Windows Mobile in which Microsoft gets a kick back for every phone sold. And part of the reason is the flexibility of the OS itself. When I reviewed the HTC Touch Diamond, a flagship device at the time, I gave props to the company’s attempt at putting a more friendly consumer-oriented User Interface on top of the dated Windows Mobile but noted the limitations of this approach. Instead, I suggested that HTC would be better off looking for a new OS partner or building one of their own. Android was my recommended solution. Almost a year on and it seems that the Google-led OS does indeed address the needs of HTC: A solid and free foundation on which the company can build on top to differentiate itself from the rest of the market through software and the User Experience. Android is very flexible. Windows Mobile was great with development tools, it can do lots of powerful things. But Android allows you to make changes from the top to the bottom layer. The hardware is only a small part of the user experience, the UI brings it alive. And it’s not just HTC that is seeing the potential of building a custom user interface on top of Android’s strong ‘out of the box’ foundations. Sony Ericsson is set to bring an Andriod-powered device to market under its previously Windows Mobile ‘Xperia’ brand, custom UI and all. I should fire my editor. Strike that, I am the editor. Thanks – corrected. Great article. 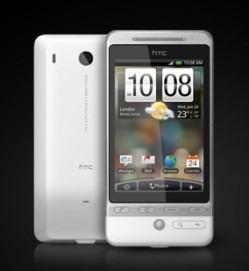 HTC has really embraced Android. Not at all. Nice write up. Nice comparision Between the Microsoft andriod Mobile & Google Mobile I am using the Nokia N95 8GB unlocked MOBILE i am going to sell the Mobile I got the Unlocking Instrcutions IN the site mobileunlockguide.com@free Of cost If anybody wants Contact me..